Save at least $32.50 on this Lake Art purchase when you join Grommet Perks. Learn more. A proof will be sent to the email address provided. Once approved please allow 3-4 weeks for production. All maps are made to order; returns are not accepted. One of a kind three-dimensional wood map. A bathymetric representation of your favorite lake or coastal area, including roads and local details. Choose from over 6,000 maps currently available. Dimensions: Map: 16" x 20"; With frame: 18" x 22" x 2"
These maps aren’t just made for navigating. They are custom-made for commemorating that special lake in your life. 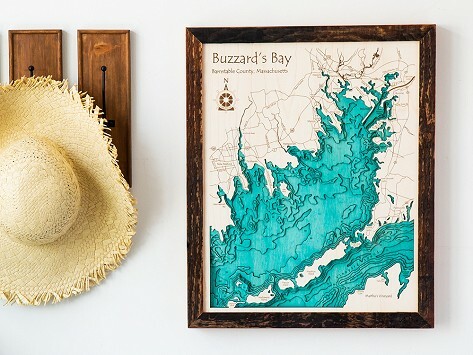 The perfect keepsake for decorating your home, cabin, or cottage, Lake Art wooden wall maps feature intricate details of more than 4,000 lakes including shorelines, two colors, and up to eight depth dimensions. Who would’ve thought bathymetry (the study of the depths and shapes of underwater terrain) could be so beautiful. The laser-cut maps also depict surrounding towns and major roads giving your lake a sense of place and belonging. Each piece is handcrafted from scratch and made to order in Harbor Springs, Michigan. Lake Art leaves no lake unfinished—the framing is exquisite. And your lake can even be turned into a cribbage board.